Some of you might think the title above is super exaggerated. Honestly, just reading this article you could change your mind. 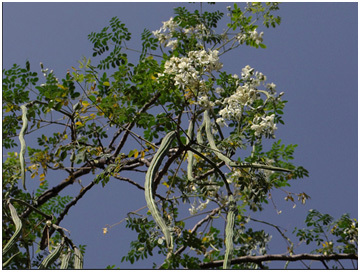 Marrungga is the local name for Moringa (Moringa oleifera Lam). It is a vegetable tree that has been cultivated and used widely as vegetable for many people in Alor Islands, Indonesia, including me. We cook the leaves and flowers as vegetable. Nothing unusual with the appearance and taste, it is similar to spinach, except the nutritional content is extraordinary high. Similarly, the plant is tolerant to drought and poor soil condition, and has exceptional adaptation to different climatic conditions2. Moringa is a multipurpose plant, utilized as food sources for many people in Asia and Africa. All parts of the plant are usable such as root, trunk, flower and seed for different purposes. 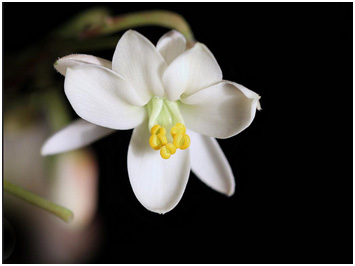 A group of scientists studying about this plant speculates that the plant is native to Asia, but grown worldwide in tropic and sub tropic regions. Moringa is also used to produce oil, cosmetics, medicine, and feed animal1. The magic is not stopped there; African people use the seed to purify water. Hence, it is a substantially important plant. Back in my hometown, Alor Islands, many people grow the plants in their garden because it is believed to have “spiritual power” to draw away evil spirit. Some people even use moringa as household remedy. The sap from young pods, known as “drumstick”, could heal wounds3. “I remember I’ve got drunk the other day and become tipsy and unconscious, my friends took marungga leaves, put into water and washed my hair. I become conscious and felt better”. A short story from Kari, an Alorese who used moringa as remedy, shows another benefit of the plant for the local people. Moreover, a series of research conducted by Melo and his colleges in 2013 and 2014 found that the plant has exceptional nutrient contents. Moringa has medical and healing properties such as anti fungal activities, anti-inflammatory, antimicrobial, antioxidants, anti-tuberculosis and analgesic effects 1,2. Nowadays, there are many products of moringa tea in market. Anyway, it is easy to make a cup of moringa tea. Grab a handful of dry leaves and brewed with hot water. The tea is rich of vitamins and antioxidants to boost your daily activities4. Dr. Monica Marcu, an expert of moringa, argues that most of the plants are famous for particular types of nutrients such as orange, carrot, spinach are famous for their Vitamin C, A, and iron, respectively. Moringa is “unusual” because it contains all the nutrients in a high amount3. Moringa, amazingly has all the nutritional compounds in a decent concentration on its leaves. Professor Mehmet Oz from Columbia University, who is an expert in nutritional food and is famous for the Dr. Oz show on Oprah Winfrey Show, claims that moringa is an energy blaster food. The plant contains three times more iron than spinach and is rich of Vitamin A, C, calcium and antioxidants5. Dr Oz said: “Taking 400mg as supplement or tea daily can blaster your energy”. That’s not just rhetoric! Moringa is claimed to have 92 Nutrients, 46 Antioxidants, 36 Anti-Inflammatories, 18 of the 20 Amino Acids, 9 Essential Amino Acids1,2. The United State Department of Agriculture (USDA) records substantial amount of protein, minerals and vitamins in the plant. Moringa plants can be grown monoculture, multi-cropping or as hedgerow in farm. It is suitable for urban garden due to having distinctive flower colors, white and yellow. The seeds or cuttings planted are cultivated 50cm in row and 1 m apart. The plant can produce leaves and flowers for consumption in short time, 8 to 12 months4. 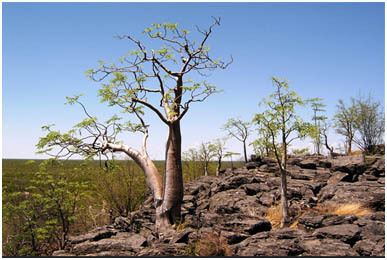 A moringa tree can grow up to 12 m high. The plant can survive and produce well in marginal land, making them a viable and an inexpensive option for the villages. Additionally, the plant requires low maintenance and input such as fertilizers and pesticides. So, do you believe in miracle moringa? Melo, V., N. Vargas1, T. Quirino1 and C. M. C. Calvo. (2013). 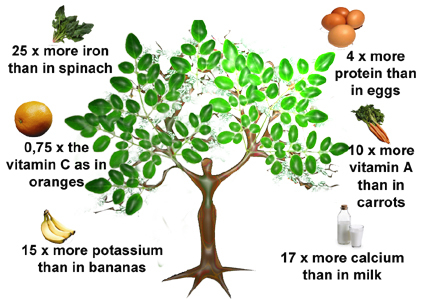 Moringa oleifera L. – An underutilized tree with macronutrients for human Health. Journal of Food Agric. 25 (10), 785-789. Hussain, S., F. Malik, and S. Mahmood. (2014). An exposition of medicinal preponderance of Moringa oleifera (Lank.). Journal of Pharmaceutical Sciences. .27(2), pp.397-403. Next Next post: Is your gut microbiota plotting to make you obese? Thanks for sharing your idea. Indeed, in some part of the region the plant has attached to local culture with myth and tale, depending on the villages. The seed is used by local people in africa to purify water. It’s interesting that you pick a great journal providing another benefits of moringa tree. It seems promising to be used as phytoremediation to overcome environmental issues such as salinity and the contamination of metal. You might be right. The plant grows in tropical Asia and Africa. However, people use for different purposes since it posses many benefits. It is interesting that you mentioned the name, “Muroonga” which is almost similar around the world. Back in my hometown we call “Marrungga”. I was wondering if you could share some information regarding the plant utilization in your country. Thank you. This sounds very similar to a plant I know from back in Sri Lanka called “Muroonga”. It’s great to see science looking into these plants and uncovering their properties, especially as some of these plants have anti-microbial properties. This plant has high protein and calcium. USDA notes that the leaves (raw leaves) contain 9.40g protein and 185mg.4 It’s substantially high compare to some vegetables. You can consume whether as vegetable, tea or capsules. Let try, and I hope you like it. Very interesting post. I have quite a few dietary restrictions, so I’m always looking for different foods to up my nutrient intake, particularly calcium and protein. I’ll definitely have to check Moringa out. Yes, you’re right that sometimes marketing strategy promoting their brand exclusively. But the fact that this plant has been growing and used by the people in my hometown for decades shows the important of this plant, given its capability to produce well under prolong drought season and arid environment in Alor Islands. Additionally, climate change has caused drought in some part of the globe. Adaptation strategy could be growing plant that has high viability, adaptation, and production under unfavorable condition. Apart from that, I do agree with you that crop diversity is paramount. Avoid dependency on particular type of crops. I’m always sceptical whenever a new ‘super food’ is announced by Oprah. The only really ‘super’ thing about any of them is the marketing campaigns. However, Moringa does sound like a useful and nutrient-dense food. I’d be interested in trying some out. It’s a bit scary that 15 crop plants make up 90% of the world consumption of energy in food (excluding meat). Rice, maize and wheat make up two-thirds by themselves! There needs to be more food crop diversity to increase food security, particularly with climate change looming. Thanks for your comment. That’s really good idea to consume it as tea. Let’s try and get the benefits of moringa. Based on some information that I read, there are 20 amino acids that build proteins in the human genome, and moringa has 18 of the 20. These amino acids are important to against anti-aging, diabetes, osteoporosis and other diseases. Really interesting post, I am definitely interested in trying some Moringa tea! Also, you have a really beautiful home town!! I suggest you to grow the tree on pots and consume them as veggie or tea if it’s possible. But if you couldn’t manage to do that, you can find the products of moringa on the reference lists that I attached below the article (No 4). Or you can visit: Moringa farm Australia to find out more information about their products. Moringa sounds like an awesome super food! Given how high it’s nutritional content is, I would love to incorporate it into my own diet – do you know perhaps where I can get some?